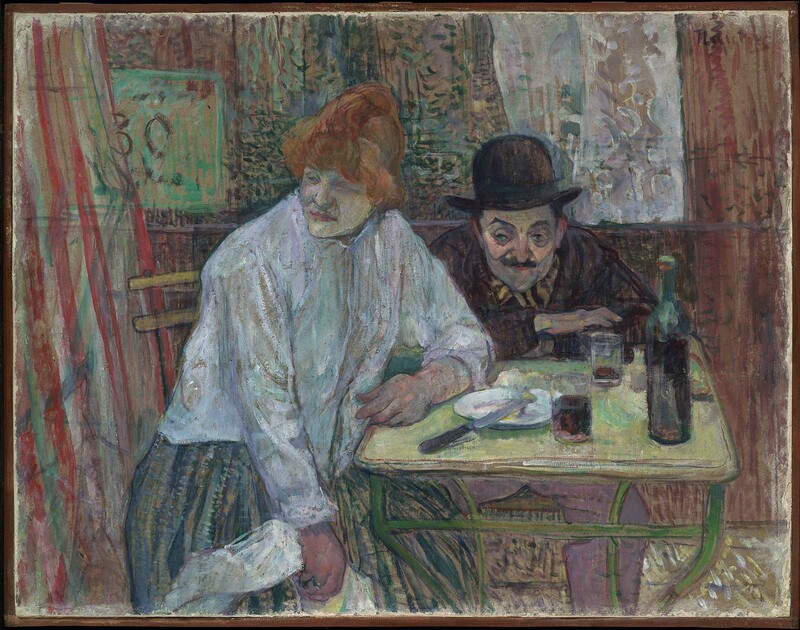 Lautrec based this painting on a staged photograph in which his friend Maurice Guibert played the role of a sleazy low-life type in the company of an unidentified woman. The practice of deriving paintings from photographs was one that Lautrec embraced starting in the 1880s. The painting’s title comes from “Un miché à la mie,” 19th-century slang for a client who neglects to pay a prostitute for her services. Might this play on words have a bearing on the enigmatic relationship between these two figures? Camentron, a dealer, was a friend of the Glasgow dealer Alexander Reid; see Ronald Pickvance, "Daumier in Scotland," Scottish Art Review 12 (1969), no. 1, p. 16. It is possible, though by no means documented, that the painting went to Scotland through these two dealers. It had been exhibited in Paris several times in the late nineteenth and early twentieth century, including at the Exposition des Indépendants (1891), Galerie Durand-Ruel (1902), and Galerie Bernheim-Jeune (1908). Francis Fowle, "Post-Impressionism in Scotland," in Impressionism in Scotland (exh. cat., National Galleries of Scotland, Edinburgh, 2008), p. 90. When Cargill died in 1939 part of his collection was dispersed in London and New York; see Francis Fowle, "West Scotland Collectors of Nineteenth-Century French Art," in Millet to Matisse: Nineteenth- and Twentieth-Century French Painting from Kelvingrove Art Gallery, Glasgow, by Vivien Hamilton et al. (New Haven and London, 2002), p. 48. The painting seems likely at that time to have been sold to Alex Reid and Lefèvre Gallery. Bignou Gallery and Reid and Lefèvre were closely associated and shared a stock of paintings.